We are offering a wide range of Canisters These Canisters sets (Glass Kitchenware) are available in various different shapes and sizes. These are specially manufactured by using quality raw material. To make these products as per industrial standards, we source high-end quality aluminum from trusted vendors of the market. We are at our place one of the leading supplier of Glass Kitchenware. Owing to their wide application, we offer these Side See Through Canister, stainless storage jars and other storage items. Made from high grade stainless steel, these canister sets are provided with durable features. We offer good quality Glass Cylinder with Lid 5x 8: Red & Brown that is designed to impart a classy look to any area where it is placed. Our Glass Canister (8670) is highly useful for storing different items with ease. 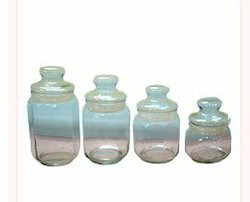 Our company has created a niche in the field of offering Glass Canister Set. Vertical container have enough deep space for storing edibles, grains, snacks etc. Available in many different sizes according to need of kitchen. 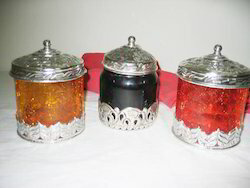 Easy to clean and wash, they have very exotic silver shining. Highly durable and made of fine quality stainless steel. Description Butter Dish With 'Butter' Written on Glass with Plate. We are one of the well known supplier ofGlass Kitchenware.